Your investment in the Aptos Chamber of Commerce is an investment in your community and yourself. Your dues help to provide service to visitors, residents and businesses. The benefits of Chamber membership will increase the more you become involved. Click on the link below to download our membership application and benefits! Monterey Bay Travel Adventures advertising available now! Be a part of Monterey Bay Travel Adventures and take advantage of this great opportunity to reach thousands of visitors each year. 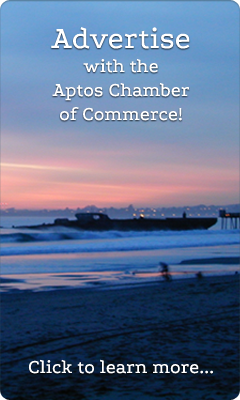 Click below to learn about all you get by being a Aptos Chamber Member. Monthly breakfast meetings are networking opportunities designed around informative agendas. Mixers are after hours get-togethers where members meet to talk business in a relaxed and informal fashion. Referrals by the thousands are made by the Chamber staff; over the telephone and in person to those interested in recommendations on goods, services and general information. Ribbon cuttings for new businesses who are Chamber Members are offered free of charge. Newsletters and Monthly Mailings focus on member news and upcoming Chamber events. Also, a great opportunity to promote yourself to your target market at very low rates. Small Business Development Center will teach you what you need to know. They offer free one-on-one counseling by appointment and “How To” seminars. Brochure racks are available at no cost to members. Promotional literature is distributed through the Chamber office and Visitor Center which has thousands of visits annually by potential customers seeking goods and services. Business Showcase provides members with the opportunity to showcase their products and services to other businesses and members of the community. Chamber Web Page provides information and a listing of members with links to their own home pages. Our Travel Guide provides an opportunity to promote yourself to the many visitors of our county. What else can the Chamber do to help you? Let us know! Please call 831-688-1467 or fill out a membership application and participate in shaping your community’s future.